Powerful confirmation of a distinctive voice in Norwegian music. A wonderful and almost addictive disc. Ce beau disque propose un portrait convainquant d'un compositeur dans l'air du temps : urbain et complexe à la fois. A new Norvegian Impressionism? Perhaps. (...) Terrific! Wallin's music is spectacular in the good sense of the word. Sound events are staged in a mystical way and with such a plastic vitality, that it seizes your guts. Act, from 2003, is a wonderfully tangled study in orchestral acceleration, full of scorching detail and driven by a visceral force. 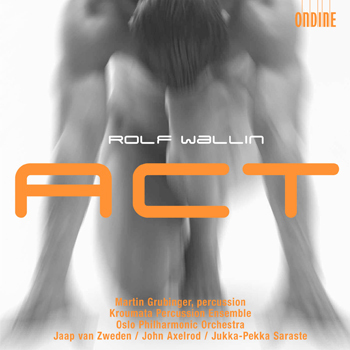 "Act" is the première album on Ondine of Norvegian composer Rolf Wallin - one of Scandinavia's leading composers and a figure of increasingly international renown who celebrated his 50th birthday in 2007. The world première recordings of three of his works feature the world-class Oslo Philharmonic Orchestra under the baton of respectively Jaap van Zweden (1), John Axelrod (2-6) and music director Jukka-Pekka Saraste (7). A project of the Vienna Mozart Year 2006, the five-movement percussion concerto Das war schön! (2006) ("that was nice!" - a comment taken from W.A. Mozart's diary) focuses on different musical and biographical sides of the picture of Wolfgang Amadeus Mozart. The three middle movements are composed on the basis of musical excerpts from his oeuvre. This recording features the works dedicatee, young Austrian percussion star Martin Grubinger (born 1983) who was recipient of the "Bernstein Award" at the 2007 Schleswig-Holstein Music Festival and chosen "Rising Artist 2007/08" by the European Concert Halls Organisation.